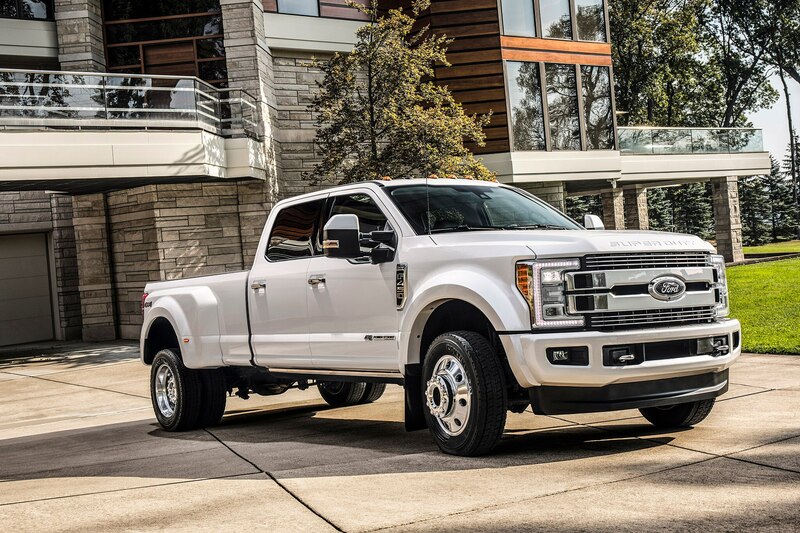 2018 Ford Super Duty touts best-in-class towing at 34,000 pounds, which is up 1,500 pounds for the new F-450 4×2 truck. The Super Duty also sees best-in-class horsepower and torque gains from its upgraded 6.7-liter Power Stroke V-8 diesel engine. “Super Duty customers expect the best, and for 2018 we’re giving our customers even more power and torque from our 6.7-liter Power Stroke diesel—delivering the most horsepower and torque available among all heavy-duty pickups,” said Todd Eckert, Ford truck marketing manager in a statement. 935 lb-ft of torque, a 10 lb-ft. improvement Ford claims. It also offers best-in-class 21,000-pound conventional hitch towing and best-in-class 7,360-pound payload capacity we are told. The 2018 Super Duty F-450 4×2 dual-rear-wheel pickup is available in XL, XLT, Lariat, and Platinum trims. The F-450 starts at $52,830 and goes up from there.